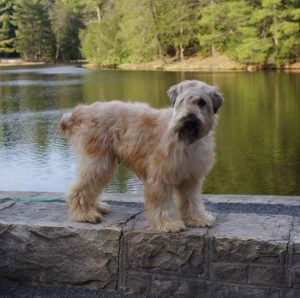 This is Liberty, our delightful retired-mama Wheaten Terrier. She is the happiest, sweetest pet you could ever ask for! She is super-companionable–loves to follow us around till we sit down at the desk or the easy chair, and she makes her bed right there. She knows she’s second in command under Snickers, her mother and our 15-year old “matriarch”, but she makes up for it with speed at the food dish when we hand out goodies from the kitchen! If she has an obsession, it would be cats. She completely adores our Siamese-mix cat, though I’m sorry to say the infatuation is not mutual… They do have a peaceful relationship…most of the time. For basic info, Liberty is 18-1/2 inches tall at the shoulder, and weighs about 40 pounds. She has had perfect health-good eyes, ears, joints, etc. and a great disposition. She is an excellent mother with a perfect record for healthy offspring. She gets along wonderfully with our other dogs and with our kids, and she loves visitors to pieces, so please come by soon–she’s ready to give you a big hug! Here is Freedom taking good care of her babies! 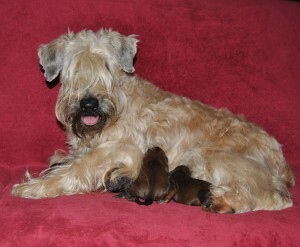 She is not just a darling and winsome pet, but a devoted mother with excellent litters. She is a great gal to have around, always ready to play, run, jump, sniff, lick, or nap at a moment’s notice. 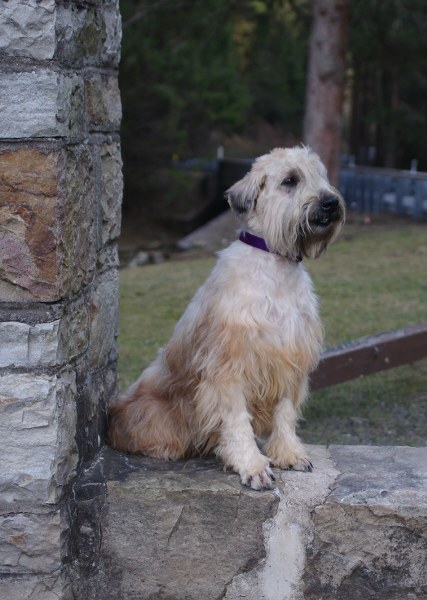 She is happy being part of the gang–easy to get along with, fun, and friendly! She is also a tad independent. We could say she loves her “freedom”! 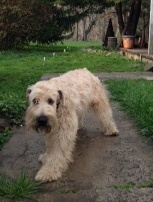 But she never goes too far away and comes running back with a happy huff and puff, glad to be home again! 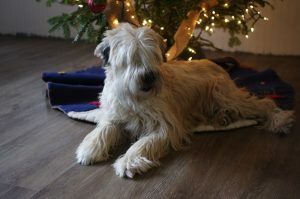 She has an American coat with lots of soft fluffy hair and weighs in at around 35 lbs. Miya is a gem! 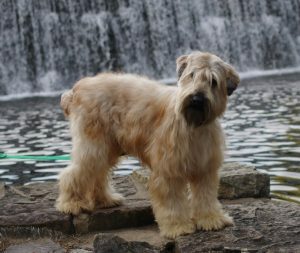 She is everything you could ask for in the Wheaten Breed–the classic friendly, fun-loving personality, ideal size, great conformation, thick wavy hair, darling face, cold nose and lickety red tongue! She is also super curious. What’s the cat doing? Where are the chickens? Can I sneak through that gate? She has been a wonderful mommy to her babies, taking good care of them and making sure they grow up to be good little pets just like herself. She has an American coat and weighs in at 34 lbs. Piper is a sweetheart, a super mom, with fantastic puppies of which we are completely proud. She has an American coat and weighs around 33 lbs. Hi! I’m Duncan! Cause I’m as sweet as a Donut! I love all people, Miya, Piper, Freedom,running outside, my food, and a good nap. I keep tabs on things to make sure everyone is safe and I work hard to keep up my good reputation for being a friendly soul with a warm heart. I can’t decide if I like having a long beard or not. It gets in my way when I’m nosing around to check up on everyone, but it keeps me warm on chilly days, so, I guess I’ll keep it for now. Duncan, our Wheaten male, has an American coat and weighs around 35 lbs.